Case Id is default syntax and can be changed as required. In this article we will take example of changing “Case Id” to “Work Order Id” in our Crow Canyon Application. This requires changes to the notification utilities, any mail templates configured in send mail actions of Workflow manager or Custom Actions, Advanced Email features. Steps 3 to 6 are required for subject key change in the notifications and steps 1,2 are required for changing the column name. Go to Application Administration –> General Configurations –> Enter “Work Order Id:” in the “CaseIdKey” column and save the list item. Go to Application Administration –> Notifications –> edit each notification utility item and update the placeholders from <<Case Id>> to <<Work Order Id>> and click on Ok. See sample screenshot below. 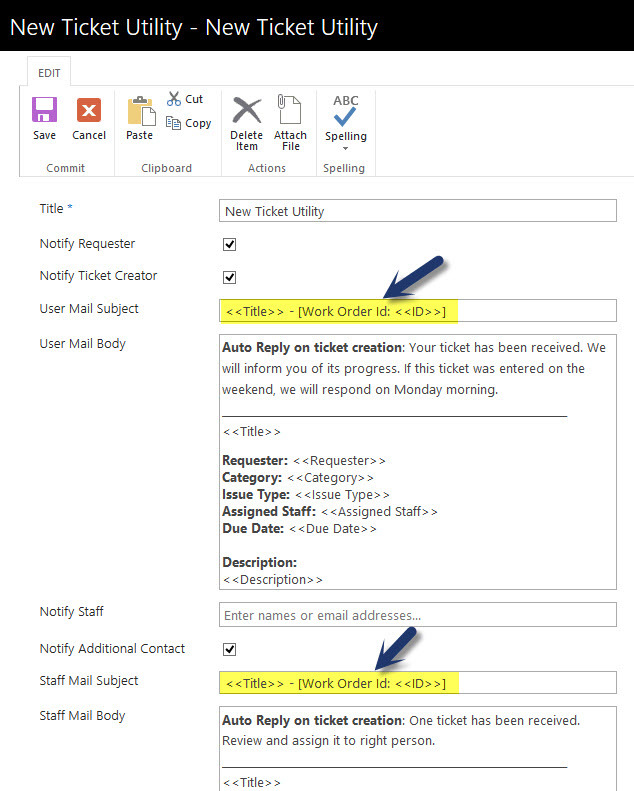 Go to Application Administration –> Crow Canyon NITRO Apps –> NITRO Workflows –> edit the workflow that has the send mail actions for Tickets list items and update the mail template with the Work Order Id placeholders as needed and save the settings.